If you want to use the Cape Town Buses for your Transport in Cape Town here is some essential info for visitors and expats. Using the MyCiti bus services in Cape Town is easy and safe. The new MyCiti buses drive mainly in specially constructed bus lanes and only in the narrower Cape Town roads and city centre streets share the lanes with the common traffic. The MyCiti main station is located at the Civic Center, a five minute walk from the Cape Town main train station. The Cape Town buses of the MyCiti bus rapid transit system were first put in service in 2010 for the soccer world cup. 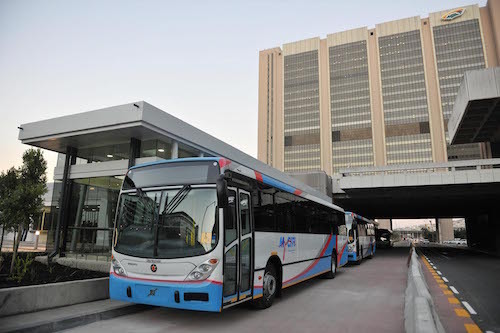 The Myciti Bus network is now covering the city centre and links many suburbs of Cape Town to the CBD. Further expansion to outlying areas is planned and many stations are constructed all over the city. 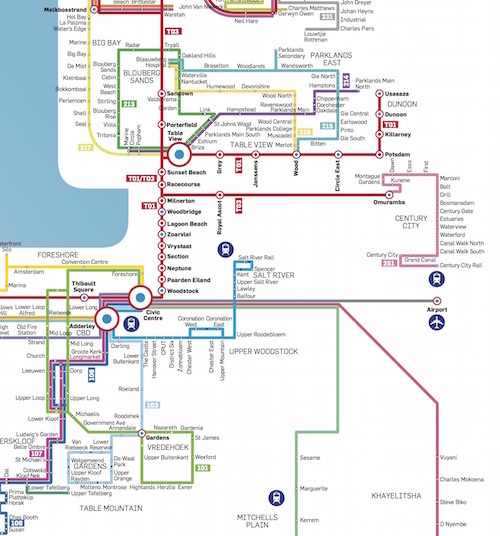 Below you can see that the Cape Town central business district is linked to a multitude of MyCiti bus stations in the suburbs from Blouberg to Camps Bay. Click on the map below to see the much bigger route network. Where can I buy a bus ticket? Travellers need to buy the reloadable 'myconnect' card. Myciti bus cards can be bought for R35 at any Myciti station kiosk and some participating retailers. How much do the bus trips cost? The fares are calculated according to the kilometres travelled. Distance bands range from 0-5km, 5-10km, 10km-20km, 20km-30km, etc. There are various tariffs such as a standard tariff or discounted mover packages. Fares range from R4.80 to R26.70 per trip, depending on distance and tariff. Transfers and stops of maximum 45 minutes are allowed. Make sure to have enough money loaded onto your card for your trips, as bus drivers will not let you into the bus should you not have loaded enough money for the destination. Can I take my bike onto the bus? Yes, bicycles can be taken free of charge, but need to be in the designated area in the bus. Should this space already be full with other users, you will have to wait for another bus. Are the buses wheelchair- and pushchair- or stroller- friendly? Yes, most of the buses have access ramps or bridges. Take the bus from the V&A Waterfront and go to Camps Bay. Use the 106 to go clockwise, or the 107 to go anti-clockwise. You can also take this route to get off at the top of Kloof Nek and walk over to the Table Mountain cableway station. Go on a round trip with bus 101 from Civic Centre to Gardens and pass the Company Gardens and the National Art Gallery or get off the Gardens Shopping Centre and treat yourself to some fine delicatessen. Check the bus routes on the map here. The popular airport shuttle links Cape Town's International Airport with the Cape Town CBD. Travellers can now use the comfortable airport shuttle bus service which takes them in 30 minutes from/to the airport. The MyCiti buses run every 20 minutes during peak time. The Cape Town airport shuttle tickets cost around R70 per trip, depending on the tariff option chosen.